With Villa shipping goals at an alarming rate at the Emirates earlier, Saints were only just clinging to 4th spot by kick-off at St Mary’s. Reed and Yoshida returned to the starting XI whilst Fulton and Naughton were making debuts for the Swans. From the off, Saints piled forward enjoying the bulk of possession but Swansea showed they were prepared for a long afternoon. They blocked shots, headed crosses away - and this became the story of the match. Clyne started really well. His runs beyond Tadic often saw him breaking into space on the right. As early as the 6th minute he set up JWP whose low shot was blocked by the leg of Fabianski. That would prove to be our best chance of the match. Despite enjoying good possession and winning several good set piece opportunities, Saints never seemed to get their delivery right. On those rare occasions that Swansea’s defenders did not clear the ball, it managed to evade our players too. Typical was a chance on 10 minutes when Fonte managed to isolate himself against Taylor at the back post but Tadić’s cross sailed tantalisingly over them and out for a throw. Saints compiled a superb passing move on 12 minutes but Clyne’s cross was greedily claimed by Fabianski. Shortly afterwards Swansea mounted their first attack. Shelvey found Gomis and the striker’s effort rattled the stanchion as it flew past Fraser’s post. Emnes had already been hobbling for several minutes and was replaced by Barrow on 16 minutes. The sub took up station on the right with Dyer moving to the left wing. You began to sense things were not going our way. On 29 minutes Fernandez cleared JWP’s cross before it reached Pellè. The linesman pointed for a corner – only to be over-ruled by Oliver. Prick! In the first 30 minutes Saints had 86% possession but the lack of end product made it feel like we were watching a Pochettino side. 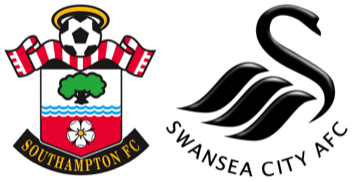 Saints never gave up and were unlucky that their efforts could not create a clear cut chance - the half chances were not being taken. Just before half-time Taylor was booked for a foul on Elia but Swansea just kept knocking the ball away from danger. HT: 0-0. There were no changes at half-time and the first serious action of the second half saw Tadic pick out Fabianski with his cross. Swansea pushed Shelvey further forward and now Gomis had a partner to help pressure our defenders when we played the ball out from the back. Swansea gradually saw more of the ball and began to threaten our defence. On 54 minutes Swansea played a ball forward to Gomis forcing Forster to dive at the striker’s feet to collect. Then Bertrand fouled Shelvey. Disturbingly the free-kick reached Fernandez but he was unable to get his header on target. Then on 58 minutes Forster raced from his goal to prevent a corner but his wayward clearance only found Taylor. The full back seemed surprised and by the time he realised it was a scoring chance, Clyne had closed him down. A minute later Shelvey almost broke the deadlock when his low drive beat Forster but bounced away off the far post. Spurred by this scare, Saints went straight down the other end and JWP got on the end of Elia’s cross but his header lacked the power to beat Fabianski. A moment later Pellè and Tadić set up JWP again but the keeper was able to save his goal-bound effort. On 62 minutes JWP dropped into a holding role as Mané replaced Reed. Mané looked lively and soon earned a corner which – this was getting boring – came to naught. Then Barrow cut in and ran at Saints defence before being fouled by Maya who was yellow carded. It was a dangerous situation but Shelvey fired his free-kick into the red and white wall. Saints then regained the bulk of possession but their increasing frustration was clearly affecting their play. Time and again they developed promising situations but wasted them. Rare exceptions were a peach of a cross from Elia that went right across the face of goal but there was no-one to touch it home and Mané shot that drew a save from Fabianski. Otherwise Williams and Co. just kept getting in the way. On 81 minutes Swansea changed their right back with Rangel coming on for Naughton. With their next attack they went ahead. Barrow carried the ball into Saints half and played a pass to Shelvey. 'Don’t back off him!' I screamed at my TV – but to no avail. Shelvey pushed the ball onto his right foot and unleashed a fierce drive past Forster. 0-1. Saints were not without passion. They piled forward in search of an equaliser but, as my notes say 'Saints are not incisive' and 'Swansea don’t look uncomfortable'. To be fair, Mané might well have scored when put through on 87 minutes. Twice he beat Fabianski but twice Williams thwarted him, clearing off the goal line. As Saints pushed on they left gaping holes at the back and I worried we would concede again. Whilst we were spared that scenario, the final kick in the nads arrived when a clumsy tackle by Bertrand downed Barrow. The defender was shown a red card and the Gambian was stretchered off. Amat replaced him for the final minutes. Saints still had time to hit another corner at the first defender and for Pellè to take a wild swing at a dropping ball and fire it high over the bar. But that was that: 0-1 and a third home defeat. Saints must feel the hot breath of the chasing pack on their necks now. I guess the most depressing aspect of the last couple of weeks is that we have dominated 2 matches against supposedly inferior opposition without reward. We can’t even blame outstanding goalkeeping displays as, apart from Hennessey’s fabulous save from Elia last week, we have rarely looked like scoring. P.S. I’m not awarding a Man of the Match on this occasion.